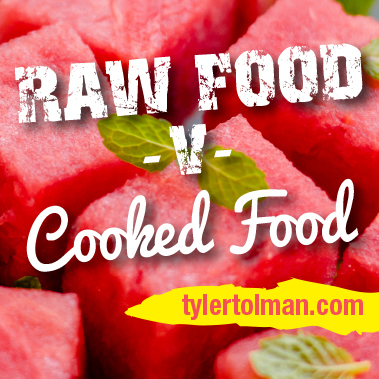 Raw Foods or Cooked Food? Nowadays nearly everybody agrees that natural and whole raw foods are better than processed and refined for good health. We got that. But opinions really vary on whether an entirely raw food diet is the optimal choice or whether cooked food can be better in some cases. I definitely believe we should all eat mostly raw, but that we also can benefit from the best of cooked food occassinally too. Are You Missing Out On the Benefits of Raw Foods? The number one reason to eat mostly fresh, raw food is the life force in it. What do I mean by that? Well, humans are electrical beings constantly seeking a renewal of energy. Every time I take a deep breath, I’m getting electricity. Every time I get out in the sun, my skin is a solar panel absorbing electricity. And every time I start to chew, I stimulate electrical forces in my body, including peristaltic action for digesting food. When food is fresh, it has a higher level of electrical energy available to the body. This can even be shown through Kirlian photography, which is able to capture a visual image of the energy aura around living things. If you photograph raw foods like a fresh peach, strawberry or spinach leaf—you can actually see the electrical current coming off it. This energy is a major component we’re getting when we eat raw food, along with vitamins, minerals, fiber and other things we need. Fresh, raw fruits and vegetables are also easier to digest because they contain their own digestive enzymes. These are killed whenever we heat food above 120 degrees Fahrenheit. This isn’t necessarily a problem because our bodies can also produce digestive enzymes, but cooked food requires the digestive system to work harder—use more energy—to do the job. 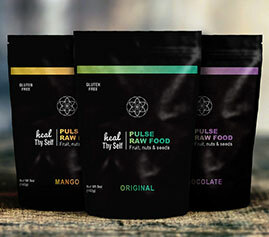 That’s why I’m such a fan of Pulse Raw Food as it has all the benefits of organic raw food. I’ve been enjoying it for over 20years and haven’t found anything that tastes as good as well as nourishes me with all the essential fats, amino acids and nutrients to THRIVE! On the other hand, cooking food can actually increase the bioavailability of some nutrients we need. For example, when you cook a tomato, you increase the concentration of lycopene, a powerful antioxidant. When you cook carrots, you soften the cell walls, making beta-carotene more easily assimilated as vitamin A. The ancient Egyptians had a rule of thumb—or hand—about when we should cook foods. They believed that if you could crush raw foods with your hands—as with oranges and apples—then you should eat it raw. If you couldn’t squeeze the juice out by hand—as with carrots or broccoli—you should cook it to digest it properly. Of course, some cooking methods are better than others to retain the nutrition in foods. Steaming and baking are better than frying in oil because some oils actually become toxic and release free radicals under high heat. (If you want to lightly stir-fry vegetables, use olive or coconut oil.) Legumes like beans and lentils can be soaked a day or two and then rinsed and cooked in just 10–15 minutes once they’re softened. They’ve been prepared this way for thousands of years as an amazing, balanced source of protein, carbohydrates and other nutrients. My personal philosophy is summed up as “raw foods and fresh until five o’clock.” I eat only fresh fruits or very light easily digestible foods first thing in the morning because the body is in a detoxification process. Once lunch rolls around, I add denser foods like salads, wraps and sandwiches—on sprouted-grain breads. At dinner I eat some cooked foods: steamed vegetables, a baked potato or hot soup (maybe along with a salad). So overall, I’m convinced that a diet of 60–80 percent raw foods—optimally toward 80 percent—is healthiest, with the remaining cooked portion still coming from natural, whole foods. I hope that helps establish a compromise in the raw vs. cooked controversy.